I'm designing my first behavioral experiment with Opensesame Expyriment. There will be 4 different lists, each of them contains 84 sentence stimuli devided in 6 blocks (so 14 sentences per block). Each list is one version of the experiment, different participants will recieve a different version. 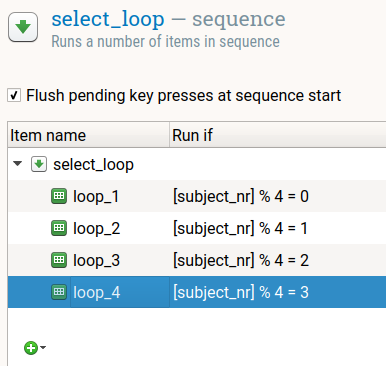 How can I get Opensesame to chose stimuli from a different list (in sequential order) depending on the version number acquired? With an inline script maybe? Also do I have to create different loops for each block of the list or is there an easier way to devide the 84 stimuli into 14 per block? I'm new at coding so I feel a bit lost right now. Quick help would be really appreciated since I need to get this done asap! So that part is pretty easy, and does not require any inline scripting. Then there's the question of how to divide each loop into 6 blocks. What kind of structure are you looking for exactly? I.e. are there 84 unique trials, or are there repetitions? Are there constraints? Hello Sebastian! Thank you very much for your help!!! There are 84 unique stimuli per version. This shows how you can split one long block up into multiple short ones. I would recommend first trying to solve it yourself based on the provided tips, but there's also a solution provided in the form of an experiment. Thanks a lot for your help Sebastiaan! I've "solved" this problem by adding seperate loops per block (1 loop = 1 block) and it worked just fine but I'll check out the extra assignment! 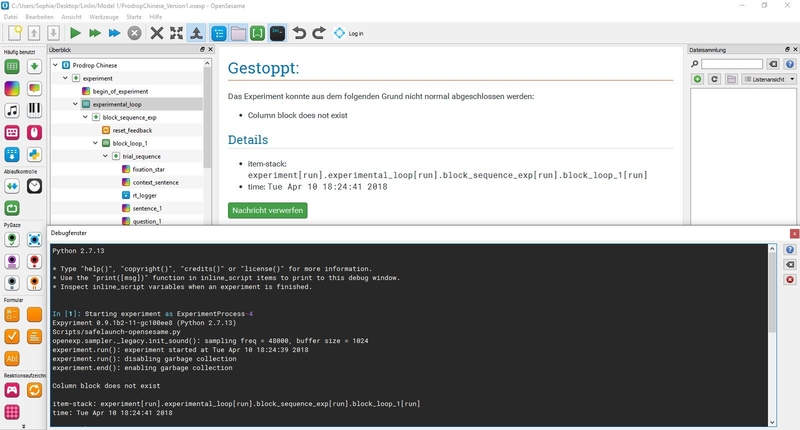 However, I've tried running the experiment yesterday and the error report "column block does not exist" occured. But I haven't changed a thing! And I don't see where the problem is either. Can you help me with this? It was running perfectly last week..
You get this error message if you have an advanced loop operation that refers to a non-existing column. If you view the script for block_loop_1, you should see these operations at the end of the script. All the best for you and thanks for this awesome free software!